The following is a listing of the playoff schedule & results for the 2018-19 Spokane Chiefs. Spokane finished the regular season with a 40-21-2-5 record, which ranked 2nd in the U.S. Division and 3rd in the Western Conference. 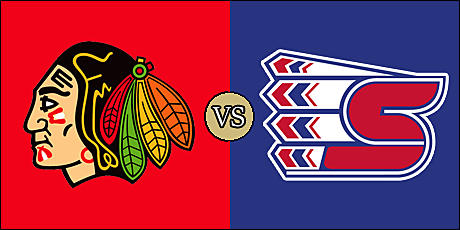 The Chiefs take on the Portland Winterhawks in the Western Conference Quarterfinals for the second consecutive season. Last season, the Chiefs pushed the Winterhawks to the brink, eventually falling 3-1 in Game 7 at Portland. The Chiefs look to advance past the Western Conference Quarterfinals for the first time since the 2012-13 Season. The Chiefs also look to advance past the Winterhawks, a team they have not advanced past in the playoffs since the 2002-03 Season. That season, Spokane defeated Portland in Game 7 of the Western Conference Quarterfinals by a score of 4-2 at Spokane Veteran's Memorial Arena. 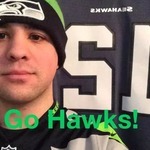 Including last season's series victory, the Winterhawks have defeated the Chiefs in four consecutive postseason series, beginning with 2010 Western Conference Quarterfinals in seven games, the 2011 Western Conference Finals in six games, and the 2013 Western Conference Semifinals in a four-game sweep. Game 3 -- Tue., April 23 - Vancouver at Spokane, 7:05 p.m.
Game 4 -- Wed., April 24 - Vancouver at Spokane, 7:05 p.m.
Game 5* -- Fri., April 26 - Spokane at Vancouver, 7:30 p.m.
Game 6* -- Mon., April 29 - Vancouver at Spokane, 7:05 p.m.
Game 7* -- Tue., April 30 - - Spokane at Vancouver, 7 p.m. The Chiefs defeated the Portland Winterhawks 4 games to 1 in the Western Conference Quarterfinals. The win marked two milestones: the first time the Chiefs have advanced past the Quarterfinals (2013 was the last time) and the first playoff series win over Portland (2003). 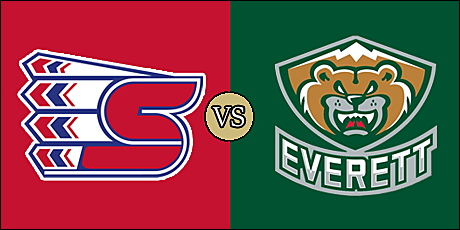 Spokane now takes on the Everett Silvertips. The last time these two met in the Playoffs was 2015, when Spokane fell to Everett in 6 games. Spokane's last playoff series victory came in 2008, a 4 game sweep in the Western Conference Quarterfinals. The Chiefs knocked off the U.S. Division Champion Everett Silvertips 4 games to 1 in the Western Conference Semifinals. Spokane has gone a combined 8-2 in the first two rounds of the WHL Playoffs. With the win, the Chiefs advance to the Western Conference Finals for the first time since 2011, when they fell to the Portland Winterhawks in six games. 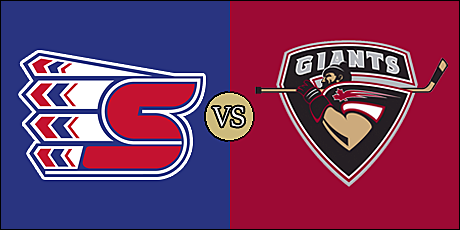 Spokane now takes on the Vancouver Giants, the #1 seed in the Western Conference. The last time these two teams met in the playoffs was 2012, when Spokane defeated Vancouver 4 games to 2 in the Western Conference Quarterfinals. These two team shave never met in the Western Conference Finals; the furthest in the playoffs these two met was the 2009 WHL Playoffs, when Vancouver defeated Spokane in 7 games during the Western Conference Semifinals.